The US Justice Department has delivered a scathing report to Congress accusing fired FBI Deputy Director Andrew McCabe of repeatedly misleading investigators.The agency inspector general's report outlines an inquiry into Mr McCabe which US Attorney General Jeff Sessions cited when he fired him last month.The report claims Mr McCabe "lacked candour" in conversations about leaking information to US media. US President Donald Trump cheered the report's release in an afternoon tweet. "DOJ just issued the McCabe report - which is a total disaster," Mr Trump wrote, referring to the Department of Justice report, released by inspector general Michael Horowitz on Friday. The president has accused Mr McCabe of bias in favour of Democrats. The review found Mr McCabe, 50, authorised his aides to disclose internal FBI and justice department information about a Clinton Foundation investigation to a Wall Street Journal reporter in October 2016. He previously told investigators as well as his former boss, then FBI director James Comey, he did not authorise the leak and "did not know who did", according to the report. Mr McCabe, who argued he was being targeted because of his involvement in the inquiry into alleged Russian meddling in the 2016 election, released a statement on Friday saying he was authorised to share information and did not intentionally mislead anyone. The report also argued he was not authorised to leak those details because it did not meet the "public interest" exception for disclosing ongoing investigations.Instead, the disclosure was made "in a manner designed to advance his personal interests at the expense of department leadership", it said. Anthony Zurcher, BBC News, WashingtonDonald Trump and the White House are trying to use the McCabe report to damage James Comey and paint the two as "peas in a pod", in the words of press secretary Sarah Huckabee Sanders.The document itself, however, tells a different story.One of the key points of the inspector general's findings was that Mr McCabe lacked "candour" in his discussions with the then-FBI director about his involvement in contacts with the Wall Street Journal. It was Mr McCabe's word against Mr Comey's, and the inspector general sided with the latter.Throughout the report, Mr Comey comes across as exceedingly cautious. He admonished his subordinates over the leaks about Clinton-related investigations that were bedevilling the bureau. 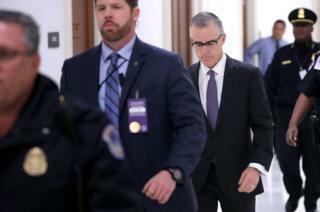 He made Mr McCabe, who was the subject of allegations of political bias due to his wife's Democratic Party ties, distance himself from the Clinton email probe.That may not matter to Mr Trump, who sees the executive offices of the FBI as a "den of thieves and lowlifes" akin to a law-enforcement version of the fictional Star Wars' Mos Eisley cantina. But if Mr Trump thinks the former director is a lying, leaking "slime ball", a closer reading of the report does little to back that up.Mr McCabe, a 20-year veteran at the law enforcement agency, was fired in March two days before he became eligible to retire with a full government pension. FBI disciplinary officials recommended Mr McCabe's dismissal based on the report's findings.But Mr McCabe has disputed the review, contending that when he believed the inspector general misunderstood him, he again went to him to try and correct his answers. Mr McCabe's lawyer said in a statement his client was unfairly treated and the inspector general rushed to finish the report before he could retire.